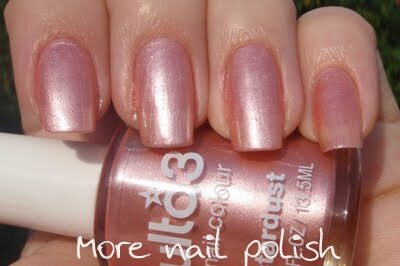 Stardust - Is a pale pink shimmer. It applies smoothly, leaving no streaks. This polish has tiny bits of pale pink glitter, but they are pretty few and far between. Very pretty. This was two coats. Bee Sting - is a dusty pink shimmer. The shimmer in this is silver. This one was a little thicker than the others to apply, but that might have been just because I did it sitting outside next to the trampoline while my almost two year old son jumped around in a frenzy. This was two coats. Silver Pink - this really reminds me of lolly pop pink, or bubble gum pink. It looks like it should taste really sweet with a strawberry flavor, or like strawberry hubba bubba. It's almost got an orange tinge to it and it has a pink shimmer. No streaks. This was two coats. Pink Supreme - In the bottle it looks similar to star dust, except a little pinker, where stardust is dustier. But on the nail this one was really sheer. This was two coats, which left a clear nail line. It's a shimmer with what looks like pale pink and light gold glitter particles. Pink Colada - Wow this one has some pigment. This was one coat. I didn't do another because I thought that the polish would end up looking much darker and redder, and I wanted to try and keep it pink. It looks much pinker in the bottle. If you want a one coater and then out the door, this one is for you. 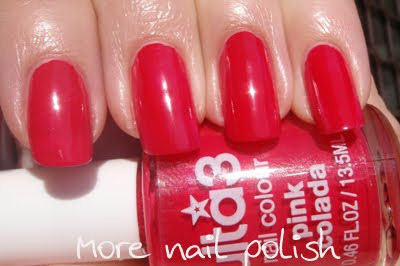 Bo peep - is a very similar to Footloose Fuchsia, but just a shade lighter. It's a strong bright pink cream with good pigment. This was two coats. Application on this was good, and easier than with the Fuchsia colours coming up. No idea why? Footloose Fuchsia - a slightly darker pink than bo peep. In the bottle they look a lot different, but on the nail, very similar, but not a dupe. This was a cream finish and I found it hard to get good clean application, as they were thicker and gloopier than my other Ulta3s. A different batch maybe? Flashback Fuchsia - is the reddest of the fuchsia colors. Again I had trouble with application for this one. It was gloopy and hard to get a smooth finish. This was two coats. Eighties Fuchsia - is a purple tinged pink. You could almost say it had some elements of a neon polish cause it almost dries matte as you can see in the pic. This also was yuck application, you can still see the lumpies on my pinky finger. I guess I just didn't get a good batch of Fuchsias. Black Plum - a rich burgundy red with a dark shimmer to it. Application was smooth. This is two coats. Appears darker in the bottle than on the nail and it reminds me of a nice glass of cab sav. Mulberry - a deep purply red jelly finish. Its ok, but it doesn't really go 'kapow' at me. I thought this would be redder, and more like when I had just finished raiding the mulberry tree in the back yard and my fingers and nails are all covered in juice. Gooseberry - a very dark purply plum. Indoors it pretty much looks black, but under strong light or outdoors you can see the plum colour. 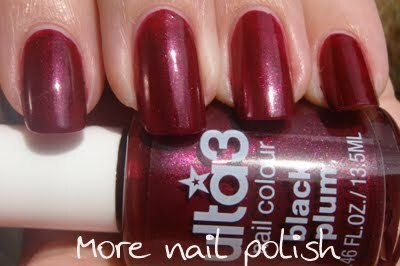 I'm not a huge fan of really dark polishes, but I could certainly use this with layering. I think you'd love ulta3 poppy too if you come across it - it doesn't look too bright in the bottle but when it's dry it's like fluorescent metallic hot pink. I love it!! Hi I love your blog! I'm an Ulta3 fanatic too, and I have 61 polishes! I have a really old bottle of Bo Peep (NYC version) from yeeaarrsss ago, and it looks more blue than in your picture. Is yours more more blue in real life, or maybe they have changed the colour over the years? I'm wearing two coats of Burgundy at the moment. How would you compare it to Gooseberry? Indoors, Burgundy looks similar to your swatch of Gooseberry, but I'm guessing in sunlight, Gooseberry would be much, much darker in comparison. Overall I'm disappointed by the looks of the Autumn range. Was so excited but the colours don't seem to really stand out. If you haven't checked out the shades Romance, Delight, Freesia and Elegant Mauve you should keep an eye out for them! Delight is very close to Stardust, a tiny bit deeper without the glitter. Romance is a peachy pink with white/silver glitter. It is gorgeous! It's on the transparent side, so you need a few coats, or maybe layer it on another polish. Elegant Mauve and Freesia seem to be in the same family of Beesting. Elegant Mauve, like the name suggests, is more mauve, and Freesia seems to be more fuschia compared to that. All the same finish though. Well that's the end of my ramble! I'll keep checking your blog! My bo peep doesn't have much blue at all, must have changed their batch. Actually I have seen two different versions of precious around too, both Ulta3. Gooseberry is almost black. Indoors you would say black. My pic was in direct sunlight and that brings out the purply red. I prefer Burgundy to gooseberry. Totally agree about the autumn range. I haven't seen Romance, Delight or Freesia, will have to venture south side to check ulta3 bin. I just swatched Elegant Mauve today, together with a few other mauve/purply colours. The colour was nice, but my bottle was gloopy and there was polish all around the top, like the lid was slightly loose.